Funny title because we all know regiments are groups of people and we all also know that people are individuals and unique. As I have said before I came to war-gaming from RPGs, I now prefer war games but I still love a good dungeon crawl from time to time. The thing I like best about the RPG experience is creating a new character, defining his or her personality, skills, values and history. I have not done any particular research on this subject but I would bet that people out side war-gaming (and I know some inside it) see the units that make up a war gaming army as nothing but a miniature or chit with a stat line. Comic 644 of the popular web comic Order of the Stick states what I believe is a typical RPG player’s view of the war games that D&D (and all other RPGs) grew out of: “In the beginning there was war. Constant war on many battlefields between many armies. War without purpose, for purpose had not yet been invented.” In other words the typical Roll Player thinks war game figures have no more depth than pawns on a chess board. In reality this couldn’t be further from the truth. Like a Player Character a war gaming unit has exactly as much personality as you give it. (BTW Every one should read Order of the Stick it is one of the best web comics out there). Units of a real world Army or Navy take on a life of their own a life that grows from the shared experience of their individual members, it grows and evolves over time. Its a rare man who serves in a unit and doesn’t think that his is the best in the world. I have never served in any real military (just to avoid confusion) but my experience reenacting has shown me that each group has its own personality and that for better or worse each individual is judge based not just on his own efforts but those of his fellows. Lets look at some real world examples. Some times the personality manifest itself at a very high level of organization: If I mention the Army of Norther Virginia most Americans will probably see in their minds first the face of Robert E. Lee then rank up on rank of thin, underfed but tough men. Their uniforms are ragged and they don’t all have shoes but rifle-muskets and bayonets are bright and sharp as are their eyes. 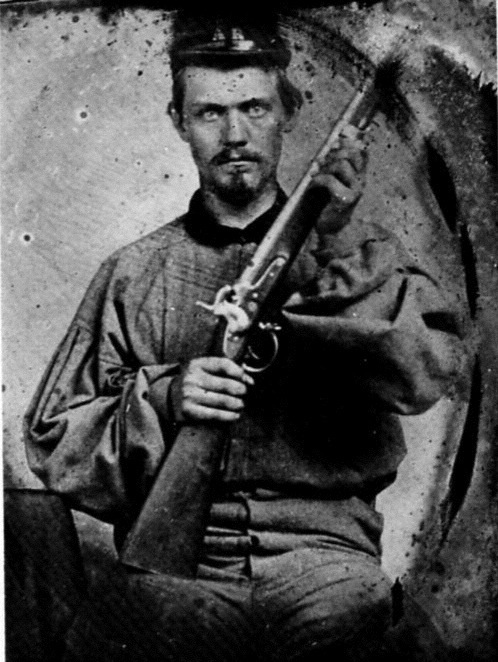 With in this general personality you have Jackson’s hard marching, hard fighting Stonewall Brigade more first among equal than best of the best, Hood’s wild Texas regiments and the colorful Zouaves from Louisiana. Each is a distinct and vital part of the whole. The HBO mini-series band of bothers shows this unit personality at multiple levels. At the highest level we have the collective personality of the 101st Airborne a division that would become legendary for its actions in battle on D-day, in the Market-Garden operation and the of course the stand at Bastion during the Battle of the Bulge. We also see the emergence of the personality of Easy company. The building of that personality starts with a simple fact that they hate their CO, we see them grow closer because of that hate untill finally they rebel and the battalion commander relieves that CO. At that point the men already very good under a bad leader become exceptional under a series of excellent leaders. These aren’t super men (the special rules for them in Flames of War not withstanding) but they are a good as any combat unit as existed in the second world war. While we see the men individually and several stand out most only play their “small” role but a role that makes the team great. I hope these historic examples give you some sense of what I am referring to in a unit personality, now let me introduce you to two of the Regiments of the Grand Duchy of D’Argent. The Guard D’Argent is the premier regiment of the Army of D’Argent, responsible for the Duke’s security and for securing the Place and the Ducal family in both peace and war. They wear the same gray coat as all of D’Argent’s Infantry regiments but cuffs, and small cloths(breaches and waist coat) are dyed purple (the color of royalty since ancient times). The guard is also distinguished by silver buttons and lace on both hats and coats. The intend message is elite but not elitist as any soldier of D’Argent can hope to serve with the guard. 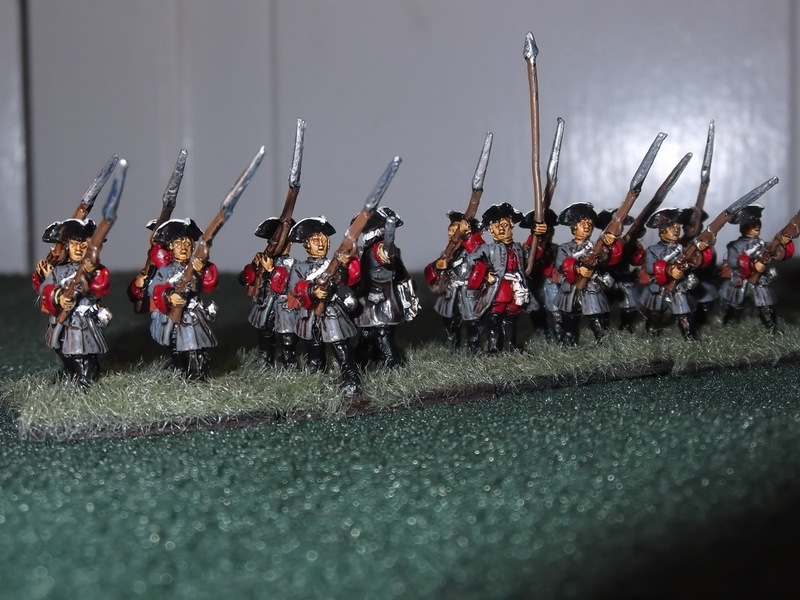 The Guard draws about half its membership in peace time from young nobles and functions as a military and diplomatic academy for these scions of the nobility. Here they receive training from some of the best NCOs and officers in the nation and learn to inter act with both the nobles of court and the soldiers of the Army. The regiment also provides contingents to D’Argent’s Embassy abroad a plum posting for a young noble or a distinguished retirement for an old Soldier. In war-time many of these young noble men (and some of the NCO’s who are usually commoners) will be used to provide officers for new regiments or to bring other up to strength. These are replaced by picked men from the regular infantry who are eager to join the Elite regiment of the nation. War time service with the guard is hard and dangerous as they are always at the point of attack and the last regiment off the field when things go wrong. Casualties are as a result usually high but the Duke never lacks for new candidates despite the danger. The Duke commands the Guard him self but day-to-day and battle field operations are under the watchful eye of Lt. Col. Caedmon Sullivan an Irish soldier of fortune distantly related to the Duke. 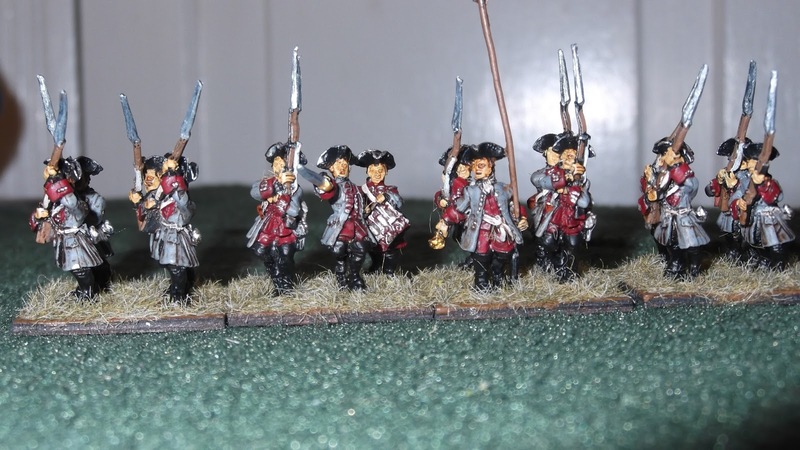 Regiment Fabris is the most senior of the Duchy’s Infantry Regiments behind the guard. The regiment claims descent from Sir Guiscard D’Argent’s original band of men at arms and retainers who returned with him from the Crusades. They have a proud history and the regiment is almost entirely made up of natives of the duchy. The Red of the units cuffs and small cloths is said to symbolize the blood shed in defense of the duchy. The Regiment is commanded by Col. Stephen Taskovics an aggressive soldier who is sometimes too inclined to close with the bayonet for his own good. The Regiment is also known for its fine band. You’ll get to meet more of the army of D’Argent in future posts but I hope the two examples will show how with a little imagination and creativity you can give those “faceless warriors” not just a face but personality all their own. Be sure to visit http://fencingfrog.blogspot.com/ for more articles and images of painted figures, models and of course war-game After Action reports.